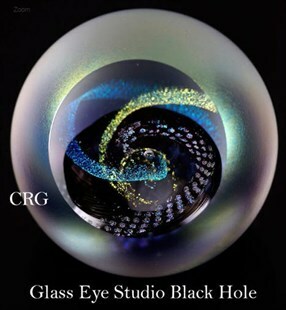 Glass Eye Studio's Celestial Black Hole glass paperweight, from the Celestial Series. A black hole is a region of space that has so much mass concentrated that light cannot escape, creating the illusion of a hole in space. 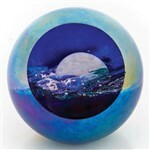 Signed GES and presented in velvet box with a story card with valuable information. Highly collectible. Approximately 3.25" diameter.